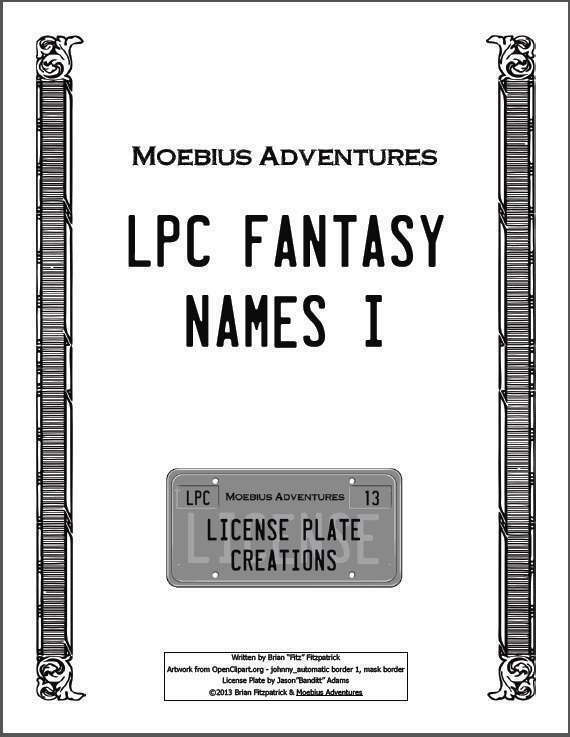 LPC Fantasy Names I takes the first 100 names from my travels and offers some creative ways to mix and match them to create your own creations. You can use it as a simple list or you can apply a transformation and make the list grow exponentially. If I roll the dice three times and end up with one name "Oza" and the "Mixed" transformation, I can quickly turn one name into four ("Oaz", "Zao", and "Zoa"). If I roll and get two names ("Leira" and "Worno") and two transformations ("Reverse" and "Backwards"), I can turn "Leira Worno" into "Worno Leira" and "Onrow Ariel".